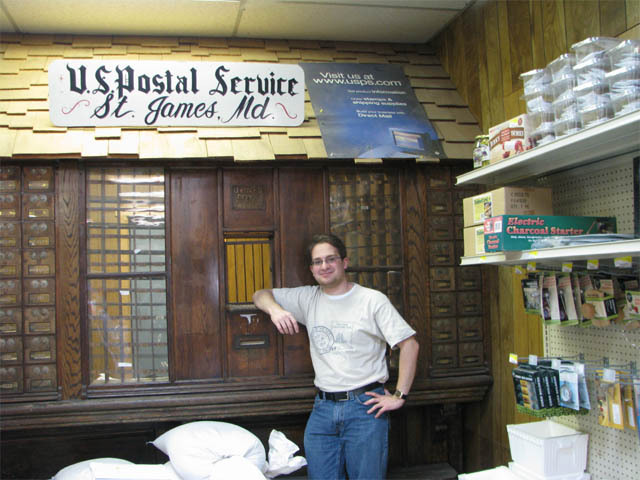 Originally established as the Lydia post office on July 15, 1889 with first Postmaster John F. Rowland (and renamed Saint James on Aug. 1, 1946), the post office served the community until it was discontinued earlier this year, April 30, 2011. The last acting Postmaster was Carolyn 'Cookie' Kline, presently at the Keymar, MD post office. She served from 2002 to 2007. The office was subsequently headed by two O.I.C.s (Officers-in-Charge), the last of whom is now a clerk at the Cascade, MD post office. Here is the fantastic "imported" post office from Pennsylvania. Admire the craftsmanship and the woodwork, the old boxes, and the marble Money Order window. THAT's a post office. Furthermore, those P.O. Boxes aren't P.O. Boxes in the normal sense. 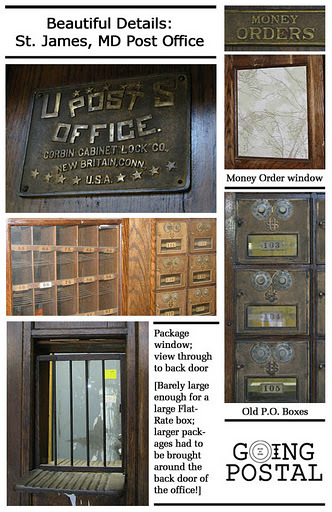 They were actually General Delivery customer boxes (22 of which were in service before closure); General Delivery box owners, who had to live within a quarter-mile radius, had to come in during business hours and their mail would be handed to them only then. The store is adjacent to a freight rail line. The post office itself was about 30 feet from the right-of-way. When trains rumbled by, this often caused the whole store to shake! I'd hate to be filling out my change-of-address form when this happened. Saint James was not the only post office to serve this community. The Saint James School, a boarding school that's a 1.2-mile drive from "downtown" Saint James, had a post office of its own. That P.O. was known as College of Saint James from December 8, 1847 until its renaming to Saint James School: July 6, 1901. The post office office was discontinued November 15, 1943. I was told that the general store, Shawley's, was hoping to apply for a Village Post Office to continue to serve its customers in any way that it can. They were in discussions with postal officials, but no official plans are in place at this time. What a neat post (pun definitely intended)! We are under contract to purchase the house across the street. According to the historical documents we received on the house, a post operation was once run by Lydia Rowland in the dining room for rail passengers!